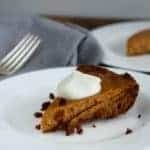 Looking for an easy pumpkin pie recipe? Gingersnap Pumpkin Pie it is! 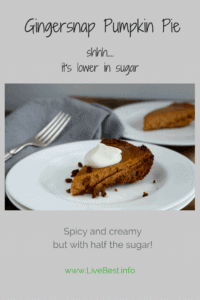 With half the sugar of a traditional pumpkin pie recipe its healthier too. With the holidays in full swing, I am the Ghost of Christmas Practical. Yes, I’m baking cookies and pies. I mean, it really wouldn’t be a celebration without them, would it? But I’m trying to keep a handle on sugar. Most of us can use a hand reducing extra calories this time of year. The latest research indicates that many of us gain just less than two pounds during the holidays. Two pounds. That’s not much. The good news is that half of us will lose most of the weight, but the other half will still be carrying the extra pounds in summer. Two pounds every year for ten years? Maybe that explains where that extra weight came from…Christmas 2006! That’s why I am excited about this pie. I reduced the sugar by half from a traditional recipe and the only one who will know it is the baker. All the Recipe Redux food bloggers are creating recipes that have some healthy mixed into their desserts. This Gingersnap Pumpkin Pie is mine. Piecrusts can be the enemy of pie bakers, but this crust takes the cake on easy. I use store-bought gingersnaps to make the crust. These spicy little cookies don’t need added sugar and there is no rolling pin required. The filling is spiced up, the sugar is toned down and the topper is a dollop of honey-flavored Greek yogurt. The yogurt provides tanginess to the spicy pie and crust. All in all, a fork-worthy pie. 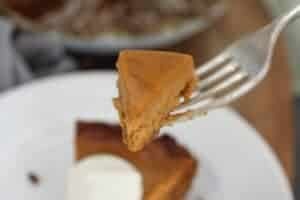 The healthier pumpkin pie could even be breakfast! Fill up on fiber. Every 10-gram increase in daily fiber reduces hunger and belly fat. Make oatmeal or bulgur your breakfast. Include an apple or pear for lunch. Add beans to soups, salads and stews. Go to bed. Sleeping 6-7 hours per night helps maintain regular weight. Move your feet. Physical activity burns calories and reduces stress. Consider a walk your mental filter for the holidays. Feed your soul. Feeling grateful, volunteering, and laughing with friends boosts your mood and sense of well-being. Looking for the best pumpkin pie recipe? I think you’ve found it! 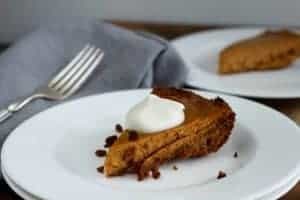 Gingersnap Pumpkin Pie, with half the sugar from a traditional recipe, is a healthier pumpkin pie. And the only one who will know it is the baker! Top it with honey yogurt rather than whipped cream for even more calorie savings. To make crust: Break gingersnaps in half. Process in food processor, pulsing 6-7 times until coarse crumbs. Pour in melted butter. Process 5-6 times until butter is incorporated and mixture looks sandy. Press crumbs into 9-inch pie plate. Use the back of a spoon or custard cup to press crumbs firmly into pie plate. Bake 8 minutes. Remove from oven to cool. In a small bowl stir together sugar, cinnamon, ginger, cloves and salt. Set aside. In large mixing bowl or stand mixer, beat eggs and vanilla to blend. Add spices and pumpkin to egg mixture, combine thoroughly. Slowly pour in evaporated milk and stir gently until mixture is uniform consistency. Pour filling into crust. You may have some leftover filling. Place in 375 degree oven and bake 45-50 minutes. The filling should be set but may have a slight jiggle when you move the pie plate. Internal temperature of pumpkin pie filling should be 165 degrees. Bake the leftover filling in a custard cup to enjoy later. To serve, spoon on a dollop of honey flavored Greek-style yogurt. See how my fellow Recipe Redux bloggers are trimming the healthified-dessert table this holiday season!